Reduce the risk of till snatches with our range of Cash Deposit Safes designed with retail shops and stores in mind. No matter what your turnover we have a drop safe ideal for your needs. Choose from Drawer Drop Safes, Cash Rotary Deposit Safes, Hopper Drop Safes and more. All designed to suit your office or retail security needs. We offer front loading, rotary drop, top loading or through the wall deposit safes for cash or keys. Drop safes are especially useful for seven till late convenience stores, off-licences, petrol stations, betting shops - anywhere where cash is collected in public areas. 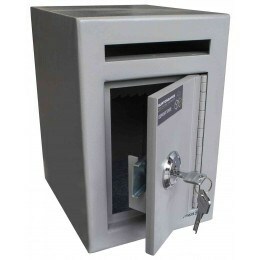 Cash Deposit Safes are essential for all shops and businesses that accept cash as payment. Deposit or Drop safes allow any team member to drop cash safely into the deposit safe without ever having access to the main safe door.